Today we were to leave Tinchuley and move on to Gangtok for the remainder of our trip. We left after the breakfast at about 1030 so that we could reach Gangtok well before evening. A surprise awaited us when we were all set to move. The Gurung Guest House gave a heart-warming farewell. Small token gifts like tea from the personal tea estate of the Gurung’s and a traditional silk muffler presented to us by Didi, really touched our hearts. 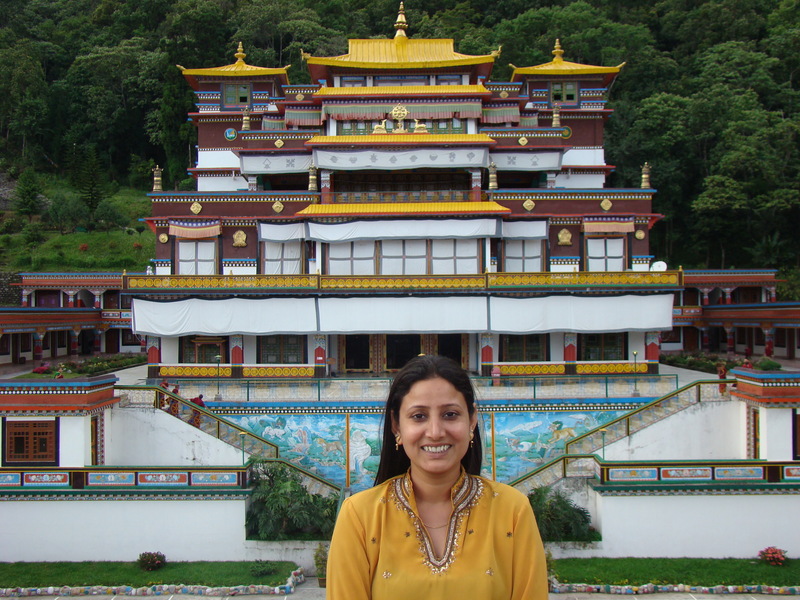 Our stay at the Gurung Guest House was a dream come true. This is not a house but a home. Personalized attention, affectionate care and flexibility makes it a different experience. Jaishree was served on demand! She uttered the word fish and it was there, as if waiting only for her demand! She talked about chicken and presto, Didi was right there with a plate! And yes, how can I forget, the food here is all organic. Everything is home grown in their own farms and gardens. Only salt is perhaps something they have to procure from market. Food is so fresh and so palatable that it invariably left us craving for more. Buzzing with activity from dawn to dusk yet tranquility prevails here. It just can’t get better than this. We will cherish this stay for long long time to come. 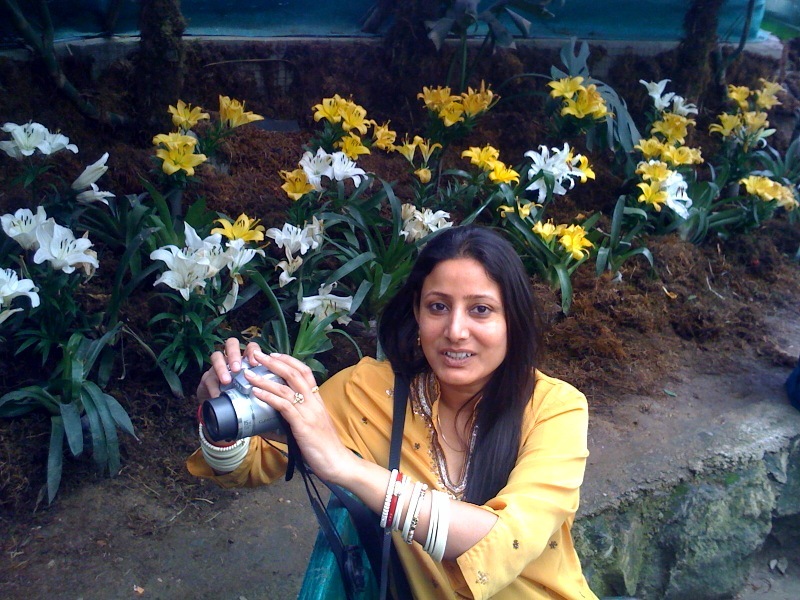 As we drove to gangtok, it was another experience of its kind. Crossing the river Teesta and then heading into the valley that leads to Sikkim provides a mesmerizing view. From one hill to another we crossed valleys and mountains to reach the border-town Rangpu. This check-post screens the visitors and leads in to Sikkim from West Bengal. From here on, the drive to gangtok was all urban. 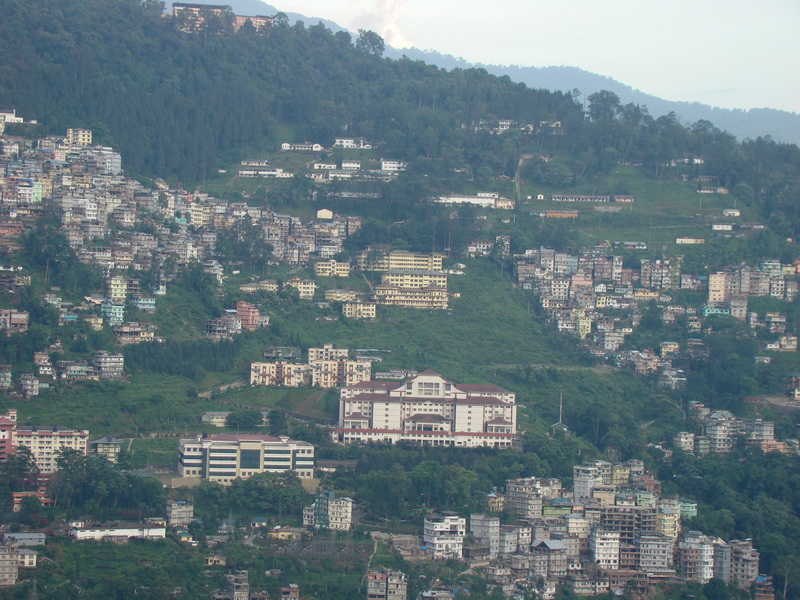 Interestingly unlike other places, here in Gangtok you cannot make out when a town ends and another starts. They are all so seamlessly interconnected! The roads are maintained by the BRO (border roads organisation). The national highway 31A is well maintained and perhaps good work done to clear up the landslides that caused the blockages during the last couple of days. We reached the taxi stand at Gangtok at about 1430 where Dipendra and Milan (our hosts at Tinchuley) handed us over to the local tour operator named Gelek Gyatso. 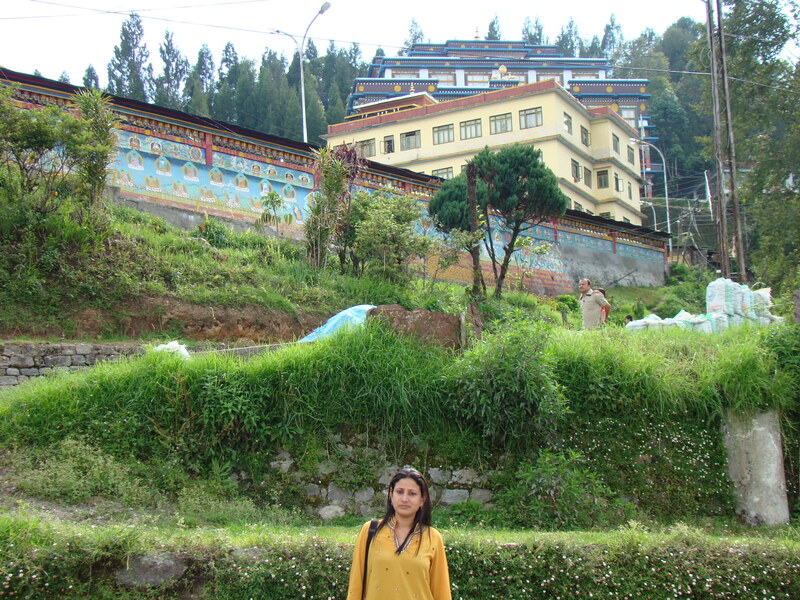 We bade thankful goodbye to both and moved on into Gangtok. As it was already after noon, there was no schedule for today. We were to rest and get ready for the excursion tomorrow. We checked into Hotel Mintokling (another family run guest house) at Bhanu Path and rested for a while. We got freshened up and then decided to take a walk down to the market. There is only one main market called the MG Road. At 1700 in the evening an entirely different view awaited us. 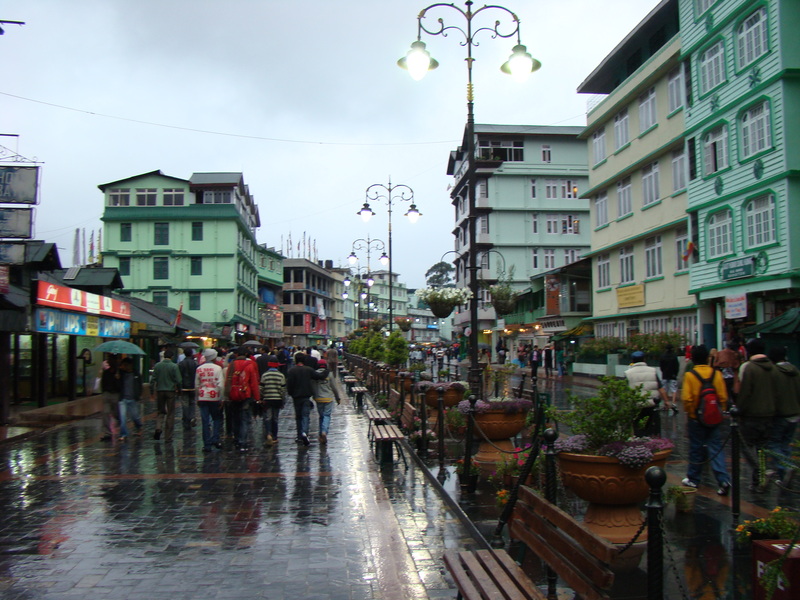 The Gangtok MG Road Market is beautiful adorned with great looking street lamps and flower baskets hanging from the lamp posts. The entire stretch is stone paved and looks elegant. It started raining no sooner than we started exlporing the market. We had no cover! We had to walk all the way back to our Hotel and by the time we reached, we were all drenched! What weather! Nathu la pass was inaccessible until yesterday and just as weather was getting to clear up, this rain! Not Again! Lets see. We’ll wait until tomorrow.